Here lies the crux of the major problem in the early development of the gas turbine. The compressor must be highly efficient-it must use the minimum power to compress the gas; the turbine must also be highly efficient-it must deliver the maximum power if it is to drive the compressor and have power over. With low compressor and turbine efficiency, the plant can only just be self-sustaining-the turbine can drive the compressor but do no more than that. 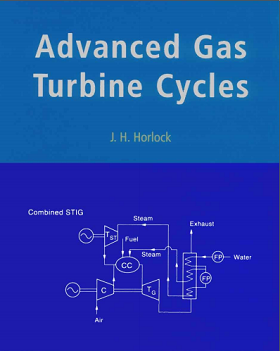 Stodola in his great book of 1925  describes several gas turbines for power generation, and Whittle spent much time studying this work carefully. Stodola tells how in 1904, two French engineers, Armengaud and Lemae, built one of the first gas turbines, but it did little more than turn itself over. It appears they used some steam injection and the small work output produced extra compressed air-but not much. The overall efficiency has been estimated at 2-3% and the effective work output at 6- 10 kW.